To make your garden beautiful you should make the landscape look good. It will set the tone for your garden. To give a good texture to your garden stones will help you a lot. Decorating your garden with stones can add more look to your garden. There are different stones that you can add in your garden landscape. Do you want to know the areas were you can add stones in your landscape? Then, you can see the below steps. You can add stones in the garden pathways. Garden pathways are necessary when for walking in the garden. This helps in not making any damage to the small plants that are in the garden while watering and gardening the plants. This also adds as a good texture for your garden. There are several stones that you can use for the pathways from pea to the pebbles and some can be used as stepping stones in the garden pathways. Add the stones in pathways based on the garden requirements. You can use stones not only in the pathways but also as a border of the pathways. Stone borders for the pebble or pea stone pathways make them steady without any disruption. To make your garden more attractive you can use a stone made sculpture as a center piece of your garden. This acts as a eye catching focal point to the visitors of your garden. The center piece should be in such a way that it makes your garden visually pleasing. You can use stone or rocks as a ground cover to the plants. There are several advantages of using rocks or stones instead of mulch. They are durable than the mulch, they help brighten the shady corners of your garden landscape, discourages the weed growth around the plants etc. Adding the ground cover to your shrubs creates a effect of living sculpture to your garden. If you would like to have a garden wall then, you can use the stones like granite, natural rocks, etc. Garden walls are used to make a separation between different species of plants in the garden. So, if your garden is having more plant species then you can have small garden walls to make a separation between them. 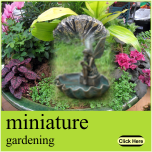 Many people love gardening and especially miniatures which add beauty to the garden. Container gardening is more popular today. Outdoor miniatures are added with fairies, stone texture, etc., to make them more beautiful. So, you can use them in your miniature pots and containers. These are few areas of the garden landscape were you can add stones to make it look beautiful and delighting.